In its last two quarters, Amazon's (AMZN - Get Report) revenue growth has slowed considerably. Furthermore, while many Amazon shareholders continue to be fanatic about the company and its future growth prospects, its lofty share price already factors this in. Let's focus on the facts: Amazon's revenue growth rate is evidently slowing down. Yet, for now, shareholders appear to be unwilling and uninterested in dealing with this all-important fact. Amazon which is priced hotter than hot, is suffering from an inability to post above mid 20%-revenue growth in the future. It's not hard to see why. Amazon has become so big that for it to come up with a further $50 billion of revenue above last year's $233 billion of revenue becomes a very challenging feat. In the above graph, I have included Amazon's Q1 2019 growth rate at the high end of its guided range. Thus, stepping back, we have 2018 year-over-year growth of 31%. Then, as Amazon hit the final quarter of the year, its Q4 growth rate slowed down to 20% compared with the same period a year ago. 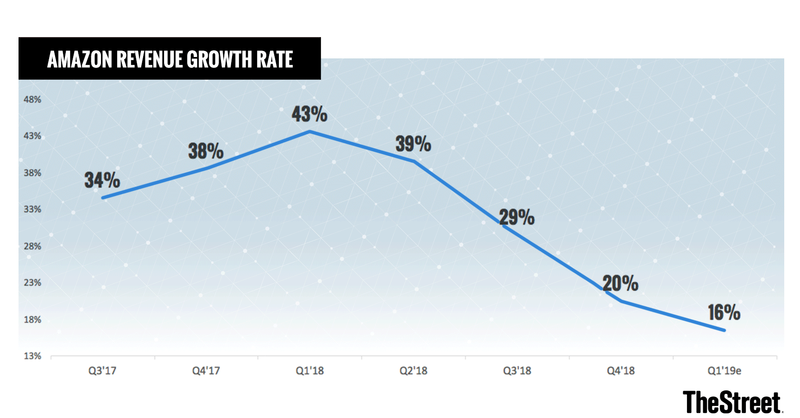 And lastly, as we go forward, we can see that for Q1 2019, its expected growth rate is now in the mid-to-high teen range, which is certainly not commensurate with a high growth company any longer. Next, Amazon said during its earnings call that 2016 and 2017 had been very investment intensive years for Amazon, as Amazon heavily invested for growth. And that on the back of those couple of years of investments, that Amazon's 2018 was able to benefit and digest those two back-to-back years of investment by not having to invest as aggressively in its business. This statement can be certainly backed by the fact that in 2016, Amazon had a GAAP operating margin of 3.1% and in 2017, a similar operating margin at 2.3%. But Amazon's operating margin in 2018 jumped to 5.3%. There is a very clear mismatch between the amount of spending which Amazon is putting into the company and the amount of growth that is coming out. In 2017, Amazon made an investment which made perfect sense in order to align itself with a revenue growth story, acquiring Whole Foods Market. Why did this make sense? Because Whole Foods is a retailer. Consequently, it is able to generate a lot of revenue but is not very profitable. As such, by acquiring Whole Foods, Amazon did not have to deploy much capital for this acquisition. In the transaction, Amazon put aside less than $14 billion in 2017 for a company which recorded slightly more than $16 billion in revenue that year. In other words, Amazon was able to deploy capital, which investors would be willing to brush off as a one-off acquisition, in return for revenues. And these revenues are ones that investors would not only recognize as a recurring revenue stream, but reward with a high multiple, given that Amazon is a high growth, disruptive company. And best of all? Amazon's acquisition of Whole Foods is not recognized in its income statement. Therefore it has no impact on Amazon's bottom line, EPS numbers. At the same time, it's highly accretive to Amazon's top line, the only financial metric that growth investors are truly interested in. One final aspect of confusion arrives when it comes to Amazon's valuation. In the table above, I have listed both Walmart (WMT - Get Report) and Microsoft (MSFT - Get Report) as Amazon's peers. How can this be? Well, that's part of the problem which investors are having. The vast majority of Amazon's revenues comes from its retail operations. Yet, approximately 60% of Amazon's consolidated operating income comes from its meaningfully more profitable AWS segment. Investors are largely pricing Amazon off its total revenue when the majority of its revenue is unprofitable. So should Amazon be priced like a retailer? Or should Amazon be priced as a software business, seeing as how just over half its bottom line comes from its software operations? I would argue that Amazon should be priced somewhere between a retailer and a recurring software business such as Microsoft's. But as the table shows, on P/Sales basis, Amazon is priced more expensively than Walmart. And on a P/Cash Flow from Operations basis, Amazon is priced more expensively than Microsoft. There is simply no rational argument for how Amazon can possibly be underpriced and offer investors any margin of safety. On the top line, Amazon's revenue growth is slowing. And going into 2019, its bottom line is likely to compress as Amazon continues to invest for growth. Yet, for now, while the bull market continues, and the song keeps playing, investors are all too happy to stand up and dance. I have no positions in any stocks mentioned.